If you are a small business or self-employed, what happens when clients pay late or do not pay at all? How does it affect your cash flow and what changes are needed? If you're a small business, how are you affected by clients who pay late or don't pay at all? 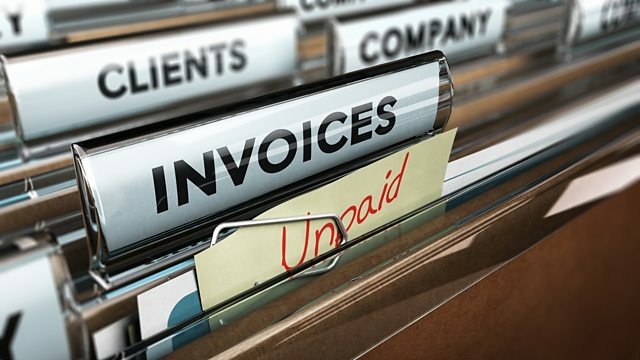 The Federation of Small Businesses estimates that around 50,000 firms go bust each year because of cash flow problems mainly caused by late payments. This is also a problem that also affects many of the UK's 5 million self-employed who find themselves out of pocket because clients can't or won't pay. So what can you do to recover the money you're owed? And how can we change the culture of late payment? Join Louise Cooper and a panel of guests with their own experience of poor payment practices and their solutions. Email moneybox@bbc.co.uk or call 03700 100 444 from 1pm to 3.30pm on Wednesday 27 February 2019. Standard geographic charges from landlines and mobiles will apply.